Following a flurry of Christmas TV ads notching up millions of views on YouTube, and a great piece by Jonathan Ford in the FT (Is YouTube the new television? ), I was inspired to take a deeper look at how UK brands are using the video sharing network. 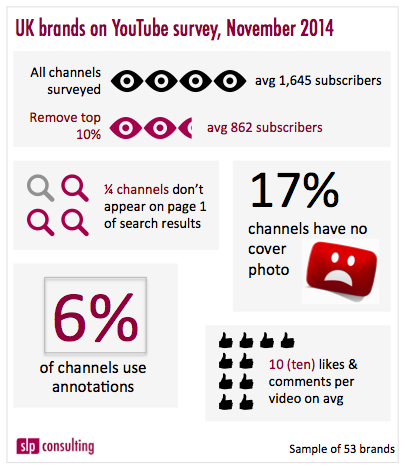 Although only publicly available data can be assessed, a look at the overall setup of channels, the number of views and level of interaction has revealed some surprising results. Throw in the context that the top performing 10% of channels significantly skewed the results, and it makes even uglier reading. It’s worth noting that we excluded the likes of John Lewis, M&S and the major UK grocers to help reveal a picture of brands operating with slightly smaller marketing budgets. This survey only looked at a few aspects of how brands are using YouTube – it doesn’t cover other hygiene factors like correctly tagging content or including a full and compete video description. What’s even more interesting, but not in the scope here, is how these brands are distributing video across all available outlets. Are emails, YouTube, other social networks, third parties and the brand’s own platforms all working together to deliver a great experience? On the evidence we see so far, it looks unlikely. But the good news (yes, there is good news!) is that optimising video and distributing it effectively isn’t rocket science. With a few standard processes, which require minimal investment, best practice can quickly become the norm.